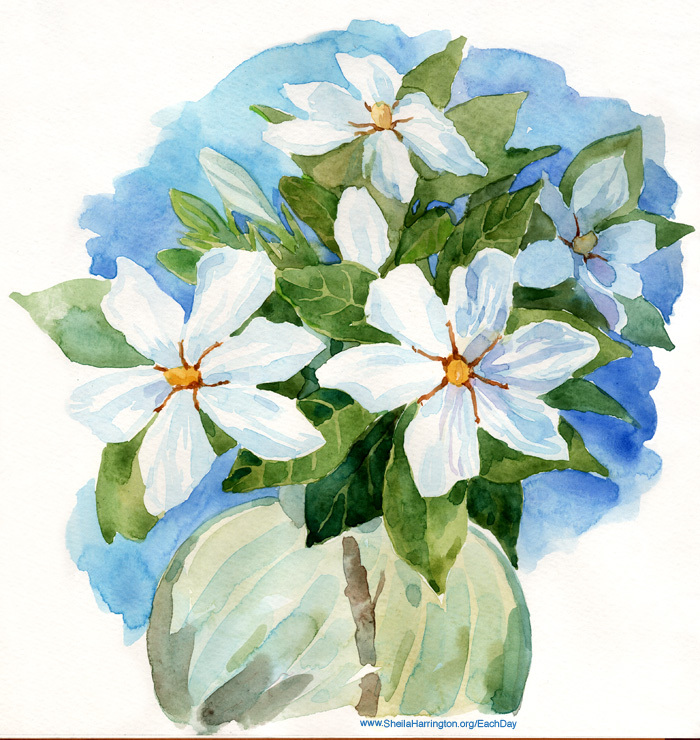 Through the window drifts the scent of gardenias, from friend Jana’s garden down the street. These she generously offered to me when I admired them (and not just because it’s my birthday!). Gardenias remind me always of my wedding day, when the only ornament for our homemade tiered wedding cake was a blanket of fragrant gardenias from my Aunt Francie’s California garden, sent to us as a surprise. One year ago today, Father Larry Madden, probably one of the most beloved priests at our parish church, departed to meet his Maker, taking everyone by surprise. When he didn’t show up to serve at Mass, a search revealed him sitting peacefully in a chair in his room, with a book in his lap. It’s probably one of the top three best ways to depart this earth, but it was a shock for everyone else. At age 78, he was still energetic, youthful, and sharp as a tack. Father Madden taught theology at Georgetown University and was priest and pastor at nearby Holy Trinity Church during an especially boisterous period of disagreement over [as yet unresolved] issues about the Catholic church’s teachings on women, homosexuality, and liturgical language. With the help of his sense of humor, sensitivity, and wisdom—and perhaps his Jesuit training—he managed to keep conversations going and minds open and moving along the road toward that hoped-for mutual understanding. 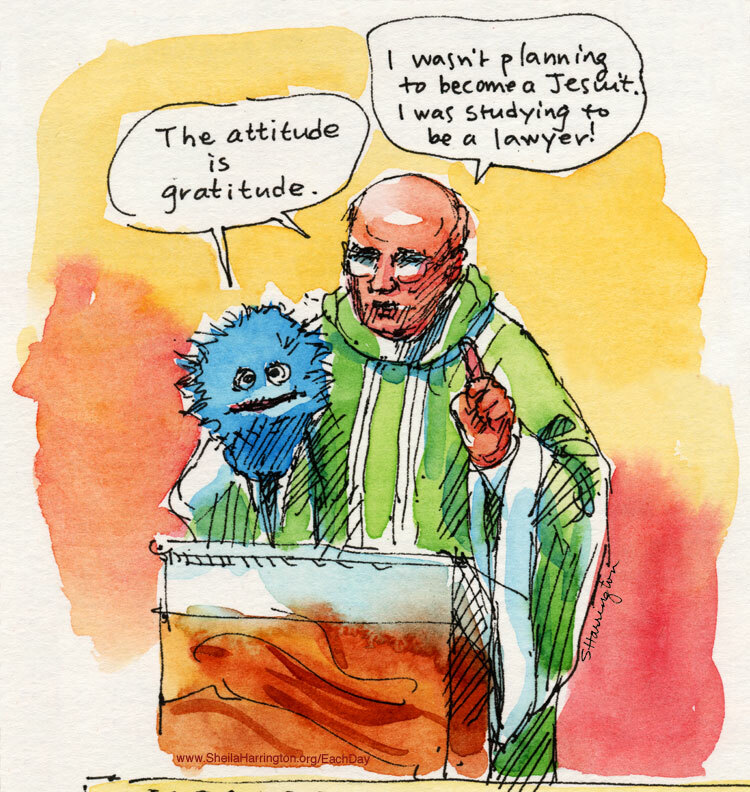 His homilies (sometimes with the participation of hand-puppet Mr. Blue) were remarkable in conveying messages of multi-level significance that reached listeners of all ages. At Holy Trinity he married hundreds of couples, baptized countless babies, and in times of trouble and joy was both an attentive listener and a thoughtful counselor. He presided at my mother-in-law’s funeral (and, my husband said, “I was hoping he’d be around long enough to do mine.”). In 1981, Father Madden was chosen to lead the new Georgetown Center for Liturgy, Spirituality and the Arts, established to explore the intersections of these realms. It was an ideal setting for his intense interest in the arts as both a path to and instrument of spirituality. A primary concern of his supervision of renovations of the parish’s aging facilities was in creating the environment to facilitate such connections. As a parishioner I can testify that his after-Mass Adult Ed lectures on symbol and ritual were passionate and profound (at Woodstock College he was co-creator of the documentary film “Ritual Makers”), yet his fascinating observations were inevitably interspersed with funny good old Irish storytelling. And besides all this, he sailed (including a race from California to Hawaii), sang with enthusiasm, and played piano (once, so the story goes, with Tony Bennett). I can’t sing “Lights of the City” without hearing Larry Madden’s Irish tenor leading the congregation. Now he’s playing piano for the angels. How we miss him. When my daughter was eighteen months old, our family made a visit to the American cemetery at Epinal in eastern France, where my Uncle Doug, a WWII pilot, is buried. 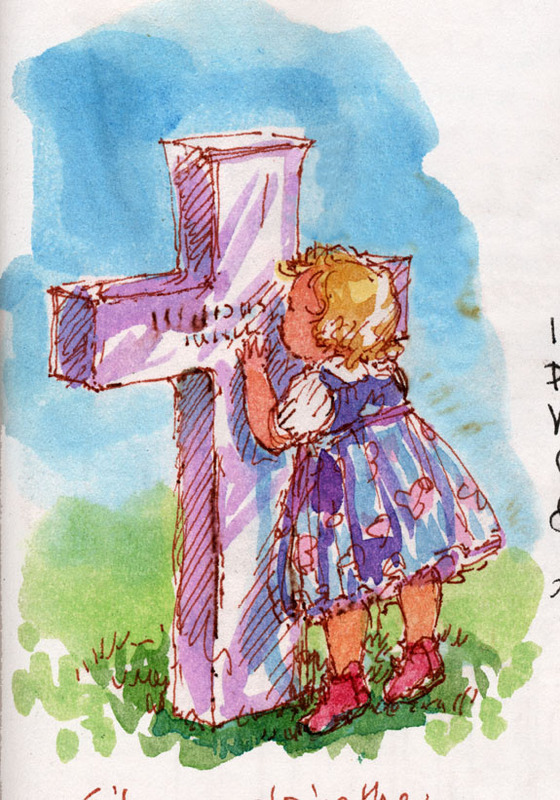 For reasons mysterious to us (she didn’t really talk much until age three), she left our side to make her own private pilgrimage among the tombstones, kissing each one before moving on to the next. 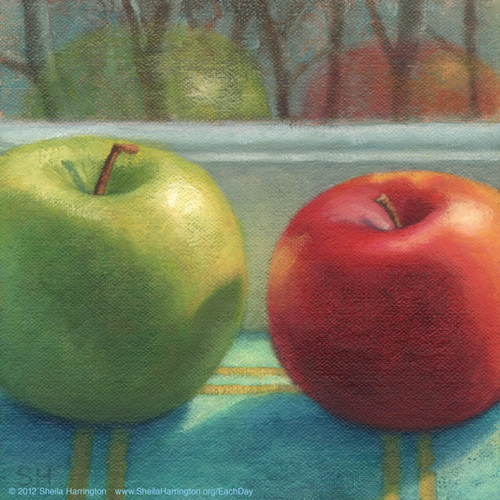 Today is the birthday of Ralph Waldo Emerson (1803-1883), and in his honor I post this poem, along with a painting of two apples… my modest selection from the options of bread, kingdom, stars, and sky. Bring diadems and fagots in their hands. Bread, kingdoms, stars, and sky that holds them all. Under her solemn fillet saw the scorn. Today is the birthday of the Prince of Binomial Nomenclature, otherwise known as Carl Linnaeus (1707-1778), the Swedish naturalist who attracted crowds to his botanical lectures by openly discussing stamens, pistils, and other shocking intimate details of plant reproduction. 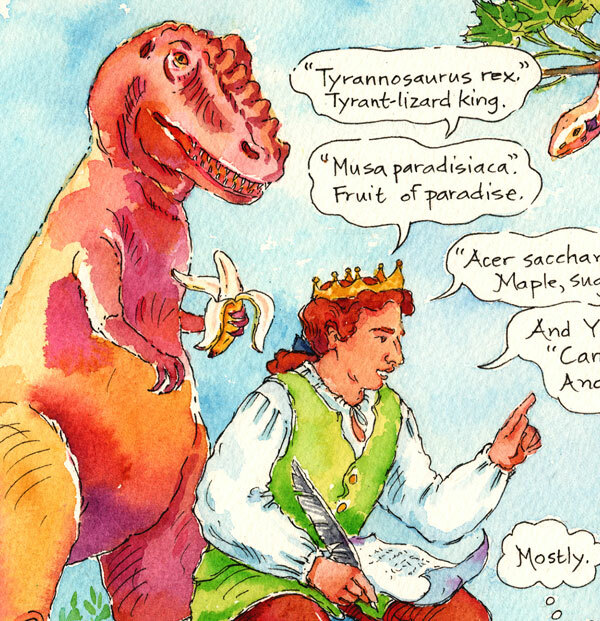 For sketches and a mini-bio, please see Prince of Binomial Nomenclature. 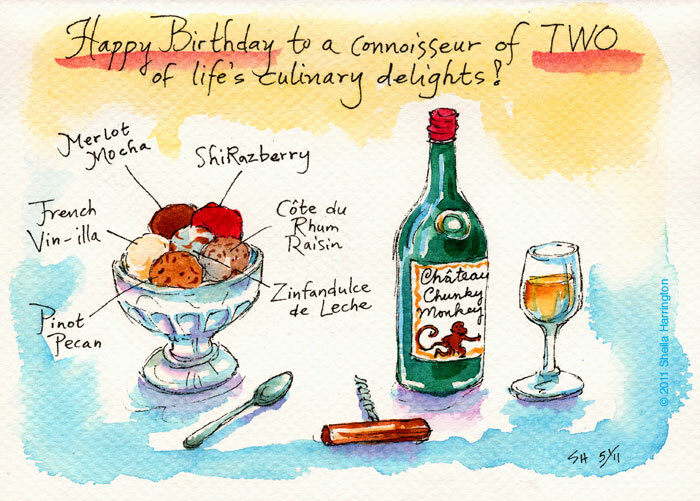 Here is a birthday card created for friend Tom, honoring two of his numerous areas of expertise: wine and ice cream. 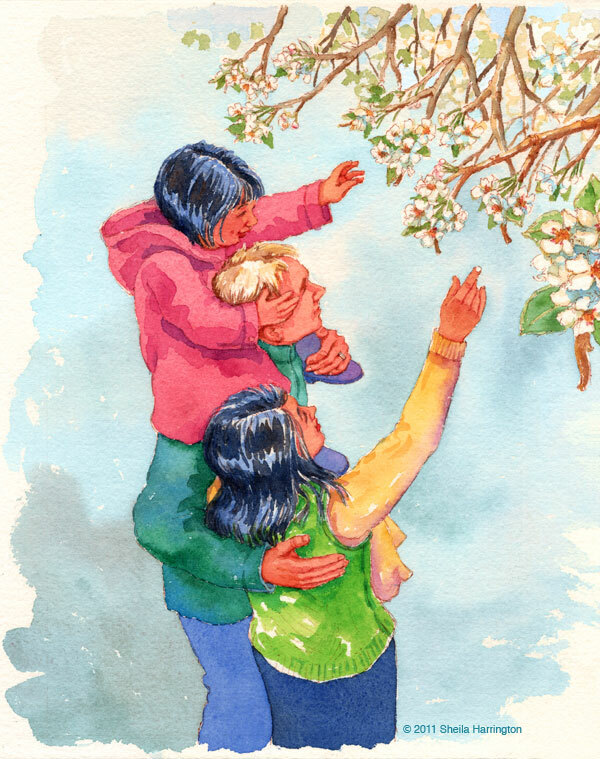 Today’s post is a watercolor from The Survivor Tree, a book by Cheryl Aubin that I illustrated, which was released last year for the ten-year anniversary of September 11th. Cheryl will be presenting her story and we will both be signing books this coming Saturday, May 19th, at the Gaithersburg Book Festival. Our family is excited that among the other presenters are Andrew Clements, a favorite author of my daughter, and local writer Sara Mansfield Taber, who recently completed a memoir, Born Under an Assumed Name, about growing up as the daughter of a covert CIA agent. And perhaps we will see some of you there, too! If you have not yet visited Tudor Place in Washington, DC, and the mothers in your life (perhaps including yourself) are fans of garden walks/historic houses/afternoon tea, you may want to add it to your Expeditions list. Built in 1816 by Martha Washington’s granddaughter, Tudor Place sits on, unbelievably, five (5!) acres in the middle of Georgetown, and is a green, flowery and bird-filled retreat from the busy surrounding streets. 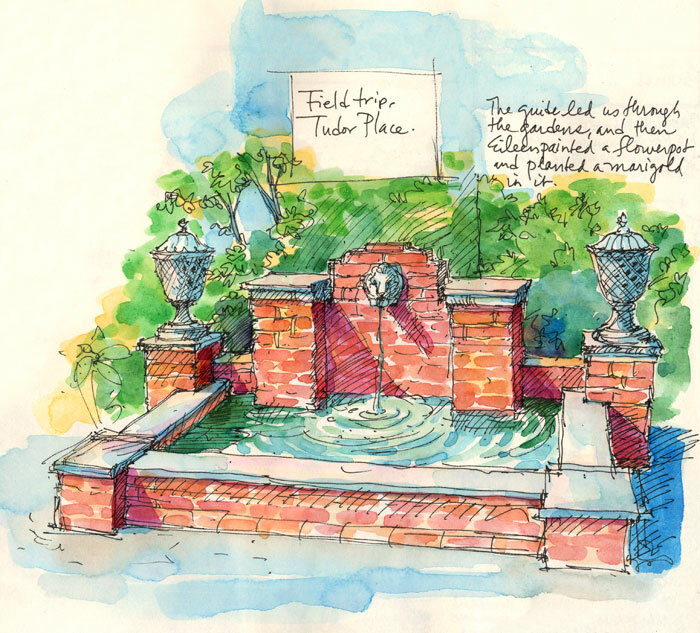 I post this sketch today because Tudor Place was one of our three-generation (grandmother-mother-daughter) destinations when my mother was still with us, and every visit is a lovely, though poignant, reminder. Happy Mothers Day, Mom, and all you mothers out there. May your day hold flowers and bird-song. The Stanford in Washington Art Gallery has just opened Artists of Woodley Park, and what a pleasure it is to see so many people, working in such a variety of media, in our small neighborhood. The exhibit runs until July 15th and includes painting, sculpture, prints, photography, ceramics, glasswork, woodwork, jewelry and film. Please check the website for gallery location and hours. 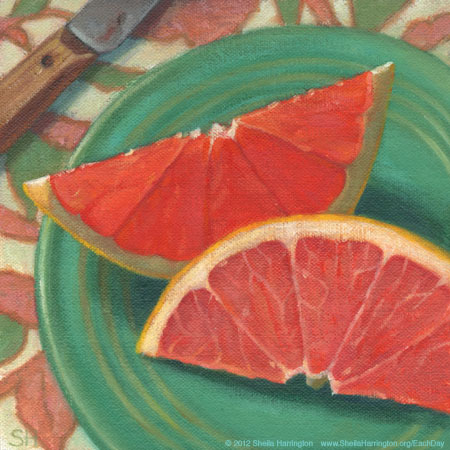 Below is one of a series of four of my still-life paintings in the exhibit. You are currently browsing the Each Day Is A Celebration blog archives for May, 2012.